I've looked through the layout data as best i can, but can't identify/find any part that deals with the width limit, or the text formatting. Well, at least anything *I* can understand. If anyone could point me to the correct lines of code, or otherwise instruct me on how to set a much wider limit (say, 800pix) and non-bold, i'd really appreciate it. Thanks, but code makes no sense to me at all. May as well be in binary. Name= _"helloindustries Insensitive, Song & Cover"
Is there any way to get it to show more characters? I tend to have a lot of albums/tracks with long titles. 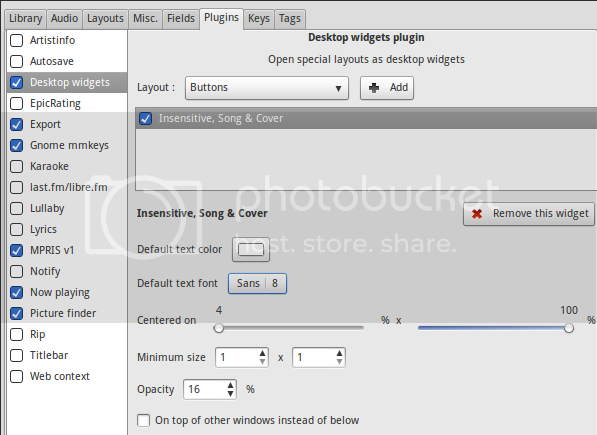 Yes, change the values in the plugin configuration for "Minimum size". You probably still have the data for the size of the cover adapted to your layout.